Screenplay: Henri-Georges Clouzot, from the novel by Georges Arnaud; photography: Armand Thirard; editors: Madeleine Gug, Henri Rust; art director: René Renoux; music: Georges Auric. Cast: Yves Montand ( Mario ); Charles Vanel ( Jo ); Vera Clouzot ( Linda ); Folco Lulli ( Luigi ); Peter van Eyck ( Bimba ); William Tubbs ( O'Brien ); Centa ( Chief of "Boss" Camp ); Mario Moreno ( Hernandez ); Jo Dest ( Smerloff ). Awards: British Film Academy Award for Best Film from any Source, 1954. Clouzot, Henri-Georges, Le Salaire de la peur , in Avant-Scène du Cinéma (Paris), no. 17, 1962; as The Wages of Fear , in Masterworks of the French Cinema , London and New York, 1974. Cournot, Michel, Le Premier Spectateur , Paris, 1957. Remond, Alain, Yves Montand , Paris, 1977. Rouchy, Marie-Elisabeth, Yves Montand , Paris, 1980. Monserrat, Joëlle, Montand , Paris, 1983. Variety (New York), 29 April 1953. Cahiers du Cinéma (Paris), May 1953. Bianco e Nero (Rome), June 1953. Cineaste (New York), nos. 7–8, 1954. Mauriac, Claude, in L'Amour du cinéma , Paris, 1954. Houston, Penelope, in Monthly Film Bulletin (London), April 1954. Sight and Sound (London), April-June 1954. Brulé, Claude, "Clouzot est-il vraiment diable," in Ciné-Revue (Paris), 2 May 1955. Film Culture (New York), May-June 1955. Bianchi, Pietro, "Henri-Georges Clouzot," in Yale French Studies (New Haven, Connecticut), Summer 1956. Fontaine, A., "Clouzot sort de sa legende," in Lettres Françaises (Paris), July 1960. Prédal, René, "Une Carrière exemplaire: Charles Vanel," in Cinéma Aujourd'hui (Paris), no. 10, 1976. Lacourbe, R., "Henri-Georges Clouzot, 1907–1977," in Avant-Scène du Cinéma (Paris), 15 April 1977. Le Peron, S., "Charles Vanel par Charles Vanel," in Avant-Scène du Cinéma (Paris), 15 November 1981. Yakir, D., "Clouzot: The Wages of Film," in Film Comment (New York), November-December 1981. Films and Filming (London), January 1986. Thomajan, Dale, "Clouzot's Wild Bunch," in Film Comment (New York), no. 376, January 1986. Hoberman, J., "Being and Nitroglycerin," in Village Voice (New York), vol. 36, 22 October 1991. Van Gelder, L., "At the Movies," in New York Times , vol. 141, C10, 11 October 1991. Canby, V., "Review/Film: Clouzot's Wages of Fear : Version Complete," in New York Times , vol. 141, C8, 18 October, 1991. Pitman, Randy, in Library Journal , vol. 117, no. 7, 15 April 1992. Porton, Richard, "A Second Look," in Cineaste (New York), vol. 19, no. 1, 1992. The New York Times , 11 June 1992. Andrew, Geoff, "Hell on Wheels," in Time Out (London), no. 1319, 29 November 1995. Howard, T., in Reid's Film Index , no. 16, 1995. Elia, M., in Séquences (Haute-Ville), no. 189/190, March/June 1997. The international acclaim accorded the French New Wave has tended to shroud the pre-New Wave French cinema in desultory neglect. Henri-Georges Clouzot has particularly been underappreciated, his films decreasingly programmed. With The Wages of Fear this is particularly surprising, given the huge initial success of the film, both critically and commercially. A suspense thriller with clear philosophical overtones, The Wages of Fear deals with a group of international losers who end up down-and-out in a poor, underdeveloped section of Venezuela, with few prospects for escaping the torpor and petty tensions of their lives. The texture of the film, with its multiplicity of spoken languages, is strikingly dense and in keeping with Clouzot's theme of universal alienation. Although the set-up is quite slow by contemporary narrative standards, Clouzot's visual design is masterful: the first hour is dominated by constant and oppressive imprisoning shadows cast over the main characters and by costumes overwhelmed with vertical or horizontal stripes. Indeed, when Yves Montand's Mario says, "It's like prison here," the sentiment seems almost redundant, so pervasive is Clouzot's visual expression of the entrapment by life itself. to extinguish the fire. Ultimately, four disparate men are chosen to drive the two explosive-laden trucks across the dangerous terrain. The core of The Wages of Fear is this trip itself, which functions as metaphor for the existential horror that comprises Clouzot's world view. Clouzot presents at least four striking images of existential nothingness, one for each of the natural elements. Perhaps the strongest, conceptually, is the explosion that literally blows up two of the men into thin air—leaving no trace of their having ever existed, save for a solitary cigarette holder, soon forgotten. The second metaphor is a liquid, black pit, into which one of the adventurers— Charles Vanel's Jo, Clouzot's archetypal man: non-heroic, petty, venal, and, above all, human—is sucked and crushed. It is not until Mario sees the third metaphor, however—the all-engulfing, destructive fire itself, that his own search for escape climaxes in Jo's death. The final image of nothingness has Mario, apparently saved from the nitroglycerine, nevertheless destroyed as he is smashed into the earth and rock of the destructive terrain, which imposes its monolithic destiny. Air, liquid, fire, earth: all are revealed as horrific and naturally violent, like men's souls. What particularly impresses today about The Wages of Fear is its striking influence on a variety of other films and filmmakers. Its metaphorical opening shots, for instance—children being entertained by bugs in the earth—suggest the similar opening of The Wild Bunch , directed by Sam Peckinpah, a filmmaker with a similar brutal world view. 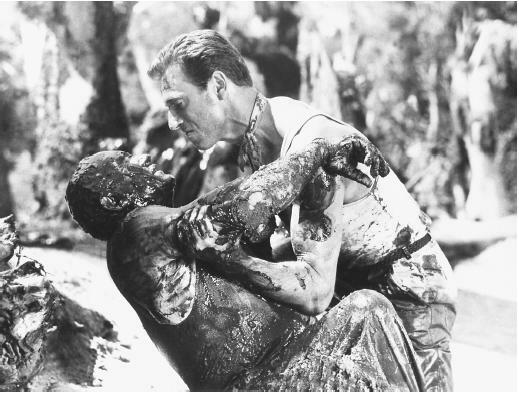 As an exemplary thriller of the navigated space, dealing with psychological concepts that relate human beings to objects and to empty spaces and with philosophical notions concerning the human condition, The Wages of Fear provides a model for John Boorman's Deliverance , Andrei Konchalovsky's equally existential Runaway Train (written in part by Akira Kurosawa), and William Friedkin's rather incongruously entitled remake Sorcerer. In its representation of Third-World poverty and local color, The Wages of Fear suggests the Peter Weir of The Year of Living Dangerously and The Mosquito Coast; and in its indictment of capitalist imperialism in the context of suspense, it suggests Costa-Gavras, if filtered through the surreal acceptance of Luis Buñuel. As action adventure genre, it has inspired films like Robert Aldrich's The Flight of the Phoenix; as a rather cynical male-bonding film, it has anticipated films as disparate as Franklin J. Schaffner's Papillon , Don Siegel's Escape from Alcatraz , and Dino Risi's The Easy Life. And finally, in one of its penultimate scenes, when Jo—rotting on the inside from a gangrenous leg and covered on the outside with black oil as he is driven by Mario along a clearly metaphorical road of like in the dead of night—announces, after "What a long street it is" that "there is nothing. . . ," and then dies, the imagery, dialogue, and psychological insights are surprisingly similar to the climactic scene of Claude Chabrol's Le boucher , a thriller of the New Wave period which rather unfairly made Clouzot seem old-fashioned.